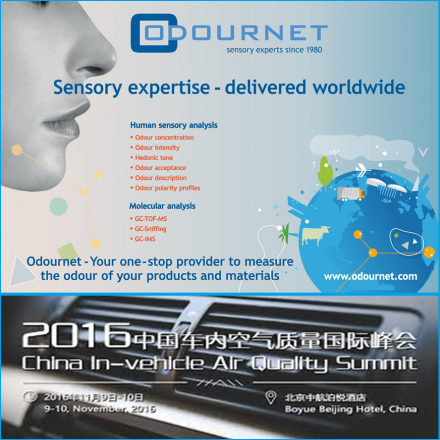 We are proud to invite you to our stand at the China In-vehicle Air Quality Summit 2016, that will be held in Beijing on November 9th-10th. This conference is a good opportunity for the vehicle manufacturers and other involved companies to show and share the state-of-the-art technologies to set up a healthy and comfortable interior environment in the new vehicles. For this reason, the creation and control of Fresh Air Quality inside vehicles, the innovation in the Vehicle-used Air Purification System, and the reduction of the Emissions of Harmful Substances by Improving Automobile Manufacturing Process are some of the main insights and challenges that will be discussed in this conference. And, since Odournet aims to be near manufacturers to solve these challenges, our expert Luciano Vera, Head of Centre of Competence of Molecular Odour Evaluation of Odournet Group, will present our new solutions to help in the testing, monitoring and determination processes of volatile organic compounds and odours in the materials used inside of vehicles. We are looking forward to meeting you and having with you some fruitful discussions that help us to draw a more healthy and comfortable future inside the new vehicles.